A new restaurant venture in Dubai by the Michelin starred chef Tom Atkiens aims to offer a relaxed dining experience with an emphasis on sharing, as the names suggest every dish is cooked and served in either a pot, pan or on a board. Michaelis Boyd Architects undertook the design scheme and they have excelled in creating an informal dining style. 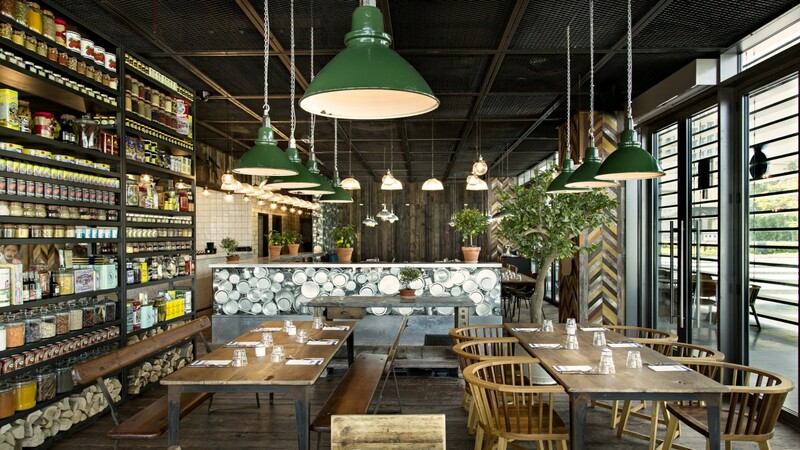 Reclaimed wood features, mismatch furniture and skinflint light fittings compliment each other, while the walls are filled high to low with a large array of kitchen utensils, crockery and spices creating a relaxed, laid back atmosphere. A large run of suspended 1950s Mazdalux industrial pendants, salvaged from a British manufacturing facility in Birmingham, were specified above the main seating area (find similar here) while a run of 1960s Hungarian glass globes (similar here) offer a more delicate aesthetic above the main serving counter.